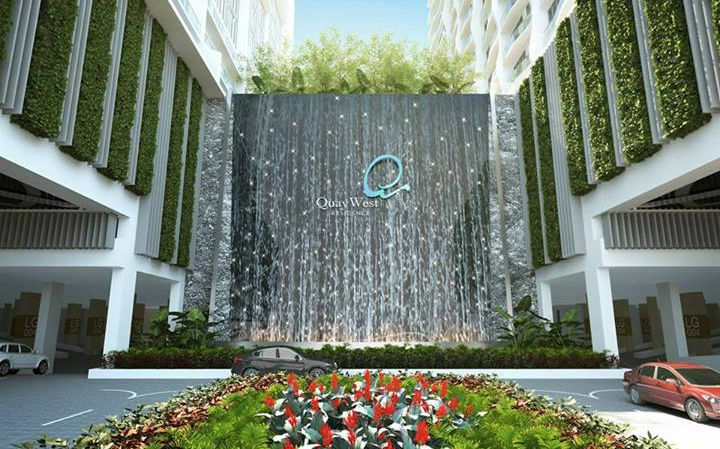 QuayWest Residence, a freehold residential development located next to Penang World City in Bayan Mutiara, Penang. This development comprises 1,235 condominium units in two 24-storey towers, 253 units of which are categorized under affordable housing. The affordable category is now open for registration. 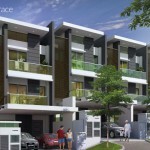 Smallest unit starts from 728 sq.ft., with an indicative price from RM 200,000 onward. Built-up Area (Tower A) : 1,246 sq.ft. – 3,222 sq ft.
How do i apply for this unit? I am able to buy smallest unit only. Please consider me. Thank you. why u guy so lazy….go to the komtar get the form or to the developer office to get it. Go to pg web to get the eligible criteria details. 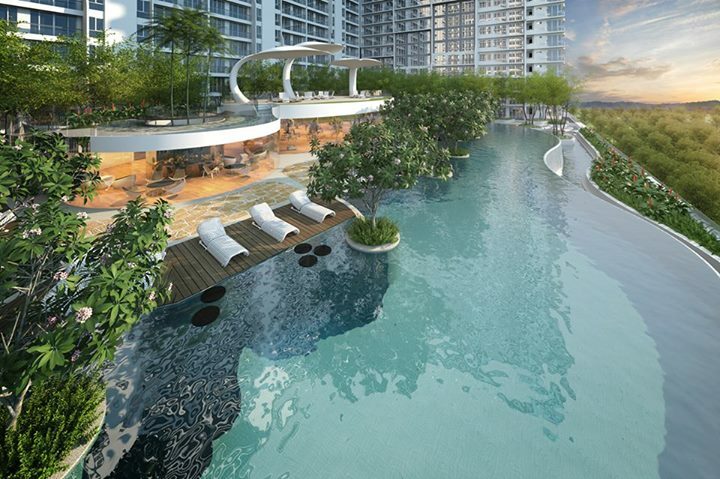 wow…affordable unit RM200k ++ at >700sqft …this is hot cake! There are 3 types of unit for affordable. 750 sf including balcony and A/C yard. I already register. Can ask me if you all need more information. But commercial title.. High assesment fee? its residential title if im not mistaken cos usually affordable unit will not be commercial. im not sure about the fee. sorry. Hi May I know how to register? Just drop by to Asia Green office and fill in the form and provide the necessary documents. This is commercial title project.. Pls check with Asia Green. Just get info from them. This is SOHO concept.. Worry in future unit will rent out for office purpose..
gt any affordable unit sell to public with 30% higher price like other project? No, because this is not fully affordable homes. 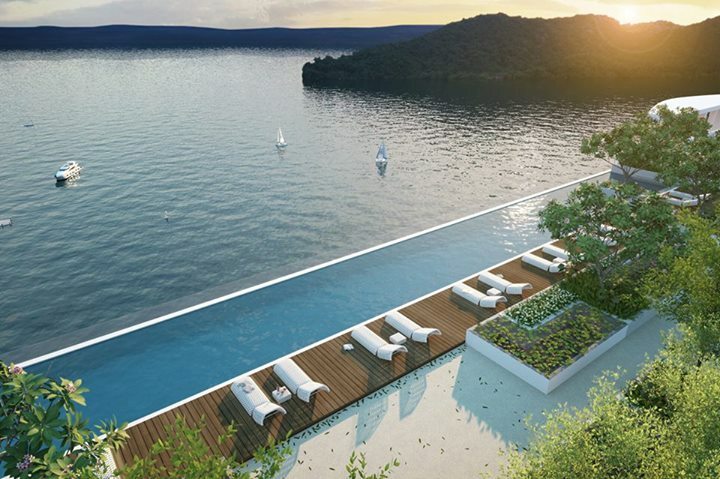 It is a mixed development with only 253 units affordable. 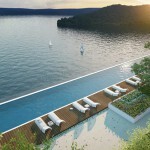 the difference is that its smaller unit, no sea view and low floor if you take the 200k package. Where the Asia Green Office locate? 650 sft for all the package type with 0.25 per sft mf. No surprise with 0.25psf mf. This is commercial title project.. SOHO style.. So, since you been to Asia Green office, you did not bother to find out its residential or commercial title? sorry whats 0.25 per sft mf? Nope I havent been to the office. I called them @ 04-262 2222 and they email me the application form, I complete it and ask my family members to submit it for me. because they only open on weekdays 9am to 6pm and thats my working time as well. What I have on hand is the brochure with all the pricing and options add-on. Maybe Ranee you can call and ask and let us know? Maintanance is 0.25psf.. If 750sqf so maintanance fee is around RM188per month.. House price consider cheap in this location..
Do you know the selling prices for the normal units 1200 sq ft, 1500sq ft and 1800 sq ft?All these units have seaview? For affording type all is 650sft only not 750. If commercial title, sorry liao, need to think twice…assessment fee, water electric bill all high kao kao I very scare lo…. Assessment is high but water electric bill is residential..
Any other type for affordable excluding 650sqf? How many unit available? I went to Asia Green office again. Confirm its commercial title. Assesstment and quick rent will be commercial rate. But water and electricity bill will be residential rate. Yes there is only one type for affordable. Thanks for you info. Do you know what is the estimated assessment & quick rent fees ? Although it is commercial title but location is very good& nice environment as well.. Better than bay residence.. 300k with 650sqf consider quite good price compare to bay residence.. Upon completion only can know. Project already fully register.. No more..
Hi, i saw the online register , do not have quay west choice in the pilihan rumah. How to know the status whether it is still available? U can call to Asia Green& ask. 200k fully register &waiting list full. 300k fully register &waiting list is abit long. 400k fully register& waiting list not too long. anyone know the layout plan for affordable? 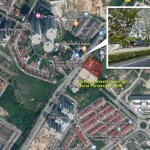 A lot of comment here, Complain this complain that, expensive lah, nibtile lah, blood sucker developer la…. but…. fully registered list in one week, haha, funny. In fact the location is really attractive in my opinion, this is the most important factor of housing purchase consideration criteria! The only concern is the assessment fee as commersial title. You shouldn’t be complaining or concern either about the assessment fee for commercial title. Anyone that wants the layout plan and other information pls email me at melvinchew@live.com. I will email you all the info all I have. I need further information.. Please email me. Thank you..
Just asking for everyone’s opinion here. 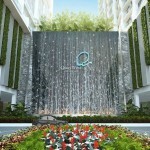 This Quay west project or I-santorini at tj tokong. Which u all prefer? depends on which area u would like to stay in the future, qb or tj tokong. The only difference is low, middle & high floor. Is it worth for those who took 400k package? The problem now is fully register.. Waiting list full.. No more already.. And this is commercial title.. It looks like commercial title or residential title doesn’t matter. Fully booked, right? fuyoh…sombong lo.. Call developer la… We are not sale agent.. Don’t know.. I no sombong la. Just want know is it really matter whether it is commercial title or residential title because Penang ppl sapu all. Any comment on this? Sorry. Just kidding.. I think is because of the price is cheap RM200k to 400k is affordable range.. RM400k will be slidely over price already.. Because u can compared with bay residences is even more expensive& 1room only with high density. I hope government should really consider& approve those who really need house for own stay.. I mean first home buyer rather than those 2nd house buyer buy then rent out after that. Although this is commercial title but house price still affordable.. As for now..full register& long waiting list for RM200k &RM300k. RM400k fully booked but waiting list still can register. They will submit yours if any rejects from government. No problem. I think as long as the price is right and location is strategic to buyer, commercial title will be secondary. Hai guys …How much is assessment fee? One off or need to pay yearly? if commercial title, need to pay 6% GST and cannot loan from bank …. All 3 type of unit also 750sqft with 2 bedroom 1 bathroom? How can I apply? I’m in the waiting list with mbpp. I heard people said they are selling below market price now for TOWER B. Last two years, they were selling at RM750 per square feet after rebates. Now they are selling RM700 per square feet. It is certainly unfair to those who have booked the unit early. Is the market really that bad or the developer so desperate to sell???????? Yes it is unfair. When it comes to ethics please do some homework on the background of this developer. The market will tell you. You get my drift? I’m affordable to buy small unit. 2 blocks with more than thousand units. Mean one level >25 unit? then will look like super density flat. Anyone know how much is the price psf? and also the maintenance fee? any open market units available? The units for RM200K ++ still available or not? How to apply the smaller unit? Anyone receive the Penang government letter that offering this project? Is the affordable house on this project commercial title or residential title? I am interested and please email me the application form and drop me your contact number. hi – can u tell me more about the lawyer fees thingy? From what I understand from them, the Property Type is not Residential, it’s under Commercial title. Also same to the Utilities, it’s under commercial title. Anyone else already got this property so that we can create one whatsup group for discussion. What is your plan about the lawyer fee? Paid RM500 still able to change anythings? Which laywer did you use? Can let me know what’s your plan for lawyer fee? Im interested on 200k unit. Still left unit? 200K and 300K fully sold out, 400K still got some units left. We have 1 allocated car park. If we purchase an additional car park for front and back, the SNP will update the Car park allocated as 0. Due to front and back CP is ‘leasehold’. We need ti sign the SNP and later developer will only issue document. Is this normal? May i know 400k still got unit left? still available? is it still available to apply. Hope to get reply back from you soonest. Thank you. Please buy from Asia green, you will get endless surprise from them. Anyone successfully got any affordable unit? 400k unit still available? I think the location is strategic because it is near LCY highway, but less noise as still a distance to that highway. went to Aspen office last mnth, some 300k and 400k units still available due to loan rejected. Worth to buy? Have you chosen unit and pay the deposit? I was told to pay 10% deposit before can choose unit, now still considering. aspen group? i thought the developer is asia greens? Yes, as mentioned in offer letter. i think the unit is through ballot for affordable category. Paid the deposit and balloted the unit on 10th Nov. But yet to sign the loan and SPA. 300k is at WING K? Mine is 400k, WING S 16th floor. Anyway, 300k unit is really a good buy. Wow… Wing S is good. Not facing afternoon sun. Yup, mine 1 is wing K high floor. You signed SPA d? i am still pending for loan approval. 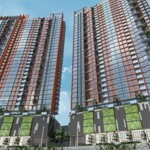 All views for affording category blocked by Penang World City towers? got my unit, 420k with 2 separate carparks..
did u created or get invited into any group? the separate car park (leasehold) u bought got written in the SNP? Hi, I have interested on affortable house. Kindly pm. hi is your carpark included in s&p? Gave up this project, too many bad comments for this developer. Some more their ballot system is not transparent, purchaser can opts to choose unit with purchasing additional car park (Leasehold Car park without lot number and S&P !!!) . I wonder if you will be assigned to an uncovered car park which is 500 meter from ur building. Also refer to their past project, i think this project will delay like The Clovers. May I know the price quotation for Tower A and B individually together with the Floor Plan (Brochure)? Thank you. pm 300K to 400K details to cindyghey@gmail.com, any open for public purchase? Pls pm for available details. We understand your frustration regarding The Clovers project. Hence, the developer changed the contractor for Quaywest so it will be different with The Clovers. Our main con is Temasek which is responsible for the construction of Sky Avenue and Sky Casino at Genting Highlands. KL contractor? That’s even worse!! 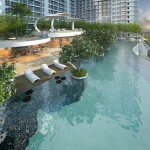 Interested the affordable unit, please contact me. How to apply? I m interested in affordable house. I hope i am wrong but I saw the site has been stop working for a few months already as I pass the site everyday to work. I bet this project 99% will be delayed AGAIN. Guys may go to site to inspect yourself. Do you still have 300k affordable house? 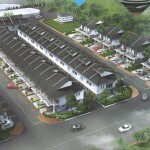 I get approval letter from perumahan penang for 400k unit. I called the developer , but the developer told me 400k unit sold out. Need upgrade to 420k unit. Different between 400k and 420k is just carpark. I am wondering , if the 400k unit sold out , why perumahan penang still approved my application ? Is it the developer over sell the carpark ? and now they wanted me to bear their cost ? And secondly , I though that penang affordable housing maximum is 400k ?? Now they asking me to pay 420k , is it still under penang affordable housing ?? I am interest with your affordable home,kindly contact me 016-4876133 to get more information,hope to get a reply soonest thank you. Since commercial title, owner can use to rent out for homestay. Good to invest. Unit still available for sale? Any price quotation and floor plan brochure can refer? Hi. Still any unit available ? I’m interested in affordable unit between 300k-400k. Hi, Any chances that this property will be delayed? Do you still have 300k-400K affordable house? I am looking for owners of quey west regarding Purchasing extra car park. initially developer promised to provide at least lease hold 99 years for the extra car park, but now seems like giving 30years license for the purchased carpark. It is not reasonable at all…. if any owner see this message please contact me at 011-1053-2477.
anyone know how is the project progress?